With only a few series that I watch this season and no particular interest (and inspiration) to blog about any of them regularly so far I have finally some time left to spend on those series that I always wanted to start or lost track of somewhere in-between. Well, first series I was able to catch up is Tokimeki Memorial (up to episode 21 now). The last few episodes finally succeeded in delivering some (harem-comedy level) drama and were quite compiling. Watching them in a row also helped to hold the tension up I guess. But of course one of the major flaws of harem shows strikes again: the indecisive male lead, here personalized through Riku Aoba. By not making some clear statements and without the ability to decline any girl proposal even once Riku puts his three love interests through quite some harsh times. Fortunately their suffering is rather well portrayed this time which gives all of them much more depth in character and shows the consequences of such a weak minded male lead. And his “solution” of the problem was laughable at best from my point of view. 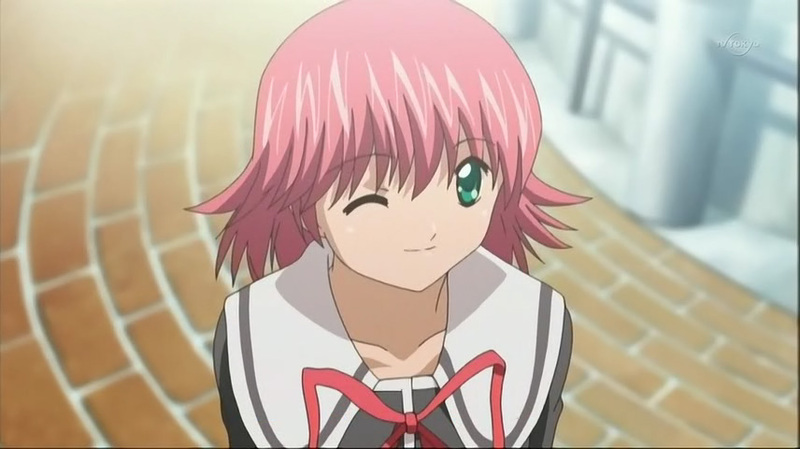 But leaving this aside (nothing else was to be expected after all) I can say that Tokimeki luckily became a rather interesting and enjoyable anime again. What to do if there is no progress with the male lead and his love interest at all? Right, just toss in yet another girl. But surprisingly enough this really works with Tokimeki, because while the three main girls don’t seem to have any interest to fight among themselves about Riku at least two of them almost immediately begin to attack the new one in town (the last one seems to be most unsure of her feelings at the moment). So after some time there is finally something happening again and I really like how Sayuri slowly gains some profile. And having seen some of the girls in swimsuits surely didn’t hurt either. Oh, and the next episode (about Haruka) was pretty interesting, too. Sorry for the hugh black borders, did want to show all of the girls. Don’t like this constellation? Well, make your own! Tokimeki Memorial, also with more winking now. You are currently browsing the archives for the Tokimeki Memorial category.